Make that comfy hammock even more comfortable with Klymit's Hammock V Sleeping Pad, designed to fit all standard hammocks, single or double wide! Hammock not included. Make that comfy hammock even more comfortable with Klymit &apos;s Hammock V Sleeping Pad, designed to fit all standard hammocks, single or double wide! Hammock Ready Design: Specifically sized and patterned to provide comfort and no-slip security while sleeping in all hammocks. Side Rail Wings: Provides ample room for movement and keeps the hammock out of your face and allows for movement while sleeping, expands your hammock for comfort. Flush Flat Valves: Secure and comfortable, our flat inflation and deflation valve allows for easy inflation, and opens wide for rapid, complete deflation. 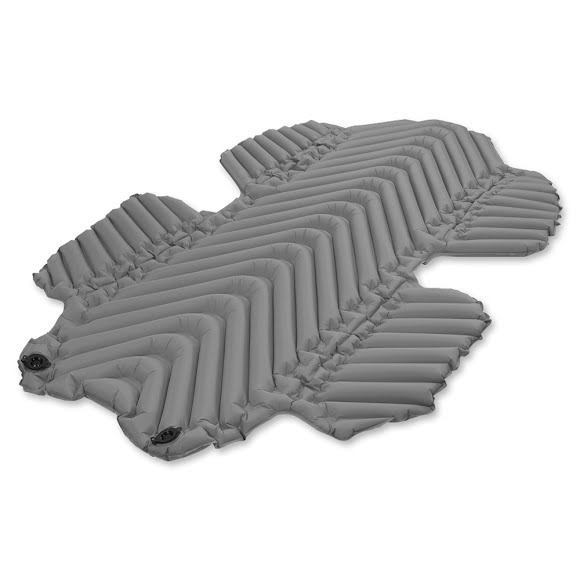 The 20D polyester material provides solid tear, puncture and abrasion resistance for minimal weight. Included for emergency repairs, a patch kit comes stored in a small integrated pocket on the top of the pad&apos;s storage bag, already packed and always at hand. Weighs only 27 oz and when going for a lightweight is the perfect pair for any hammock. The 20D polyester material is the best combination of backcountry durability and ultra lightweight.